We have discussed wind transported soil in our previous post. We know that sand blown by wind takes shape like dune. 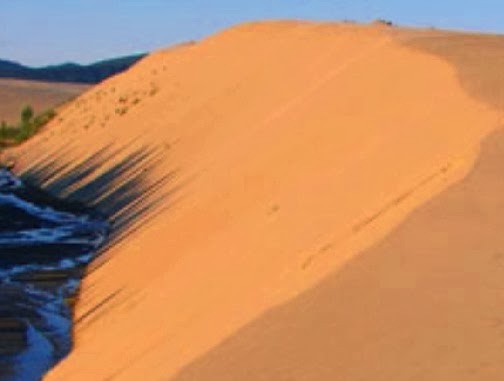 When a dune is formed, wind forces to blow sand over crest of it. Sand particles as usual roll down along slopes from crest which produces a natural compaction in one side and loose deposit in other side. We are making clear this fact here. In the windward side, a sand deposit of compacted state is found and the opposite scenario are found in leeward side where roll over sand produce loose deposit relative to windward. e.	Rocky and alluvial planes of western USA. 1. We know that particle size of sand is controlled by wind velocity i.e. it provides a sorting action of having same size particles at particular location. So distribution of particle size is uniform. 2. As discussed above wind velocity is key factor controlling grain size over path from source to particular distance. As wind carries bulky particles lesser distance than small one, the grain size generally decreases with distance. 3. As discussed above the sand in windward is more compacted than leeward. So relative density is all affected. In windward side, the relative density are sometimes found (50-65) % which may be decreased to (0-15) % on leeward side.